Greetings from the tundra. 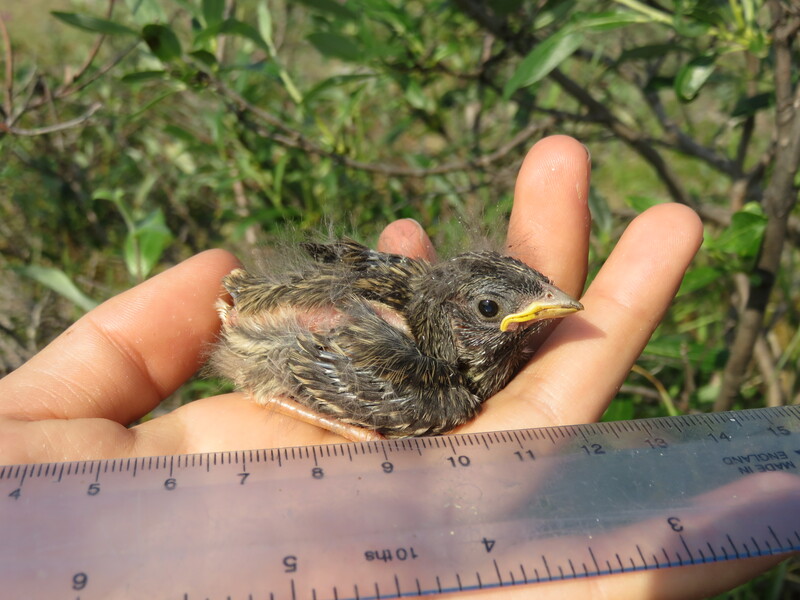 The past few weeks have been some of my favorite of the field season— time for nestling and fledgling birds! Nestling White-crowned sparrow on hatch day. The transition between the incubation stage (when females are secretive and hard to find off the nest) to the nestling stage is really dramatic. After 2 weeks of rarely seeing a female bird, all of the sudden adult birds are flying everywhere carrying food to their young and scolding anyone who dares approach a nest. Food carrying birds are funny to watch— often they appear to have dark colored whiskers around their beaks, which are created by the crane flies, spiders, beetles, and caterpillars they feed their offspring. The same nestling at age 7 days! 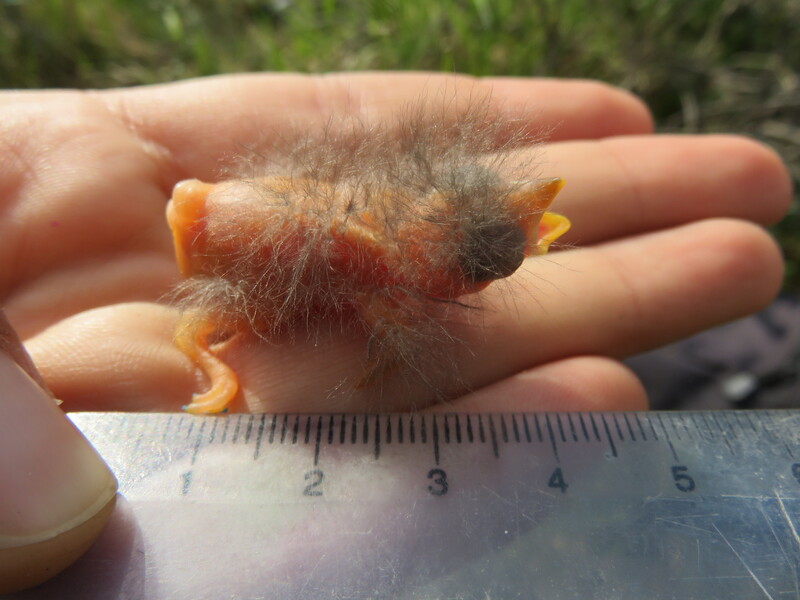 The most amazing thing about nestling birds in the Arctic is how fast they grow. White-crowned sparrows are altricial, which that means that when young birds hatch they are dependent upon their parents for food. They also have a lot of growing to do before they are able to survive on their own. On hatch day, nestling sparrows have barely any feathers, their eyes are closed, and they can’t thermoregulate. However, in only 8 short days these birds will fledge and leave the nest. The rapid pace that these birds grow is fascinating to me. Take a look at the pictures on the right to see how quickly White-crowned sparrow nestlings grow and change. Fledgling Savannah sparrow. This bird could fly about 5 feet when I found it. At this point in the field season, my white-crowned sparrows have been out of the nest for at least a week or two. Last week, when most of my juvenile birds had just left the nest, I rarely saw them. However in the past few days I’ve started to see the nestlings (now called fledglings) everywhere. Some days it seems like every shrub on the tundra has a fledgling bird in it hopping from branch to branch and screaching as it begs for food from it’s parents. While they are definitely conspicuous to predators at this stage, they’re also much better fliers than they were just a few days ago. When sparrows first leave the nest they can hop across the ground but don’t fly yet (see here for why birds leave the nest before they can fly). These days, however, I’m seeing “fledgies” fly up to 100 feet in one bout. 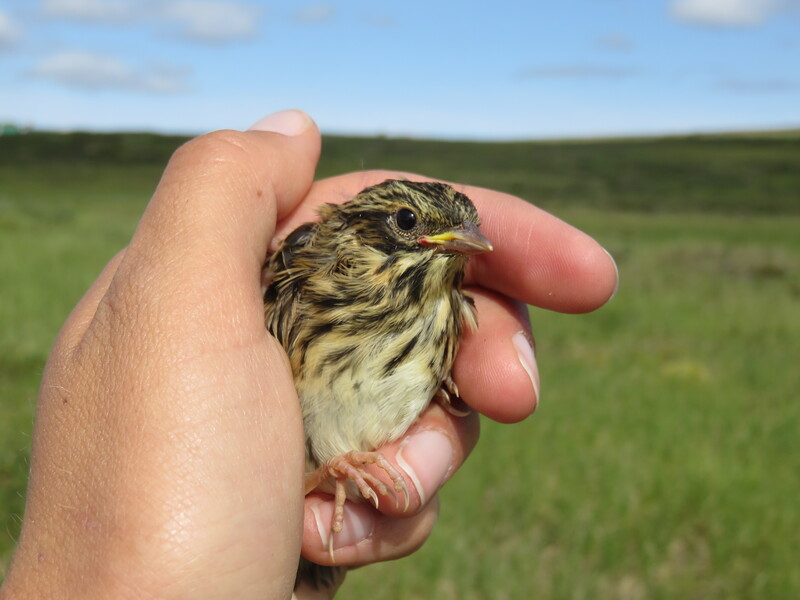 While I really enjoy watching these fledgling birds on the tundra, the focus of my work at this point in the field season is actually tracking their parents with radio-transmitters and seeing what they do as they start to prepare for Fall migration. In my next post, I’ll be sure to share some of my preliminary observations from that portion of my work.